All these full length Summer dresses come in sizes 32-40 with a total length of 145cm.Elastic at the back, fitting the bust nicely. Prices on request so feel free to contact me. Full length Summer dress with black polka dots. Full length Summer dress with white rose pattern. Full length Summer dress with black rose print. Full length Summer dress with white leaf print. Full length Summer dress with white swirl print. 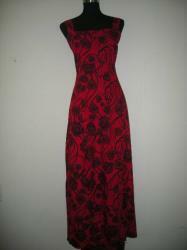 Full length red summer dress with black rose pattern. Various sizes available. 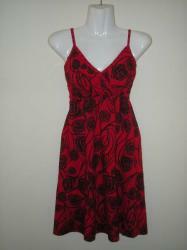 Full length summer dress with red rose pattern. Available in various sizes. Full length summer dress with black and white rose pattern. Various sizes available.